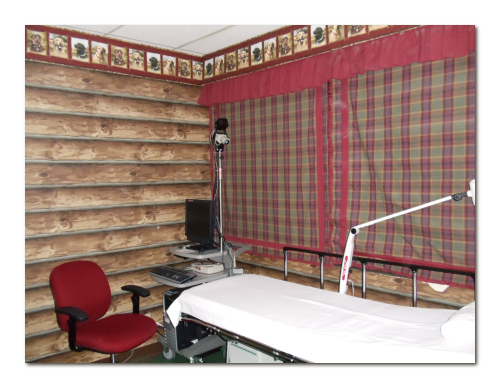 Our EEG lab is one-of-a-kind friendly comfortable “log cabin” style that puts your child at ease. Our EEG technicians are friendly and great with children, helping to make their EEG a good experience. Be aware that infants and toddlers may cry during the set up due to being restrained; the application of the electrodes is painless. Our EEG technician measures the scalp and marks the electrode placement locations with a grease pencil. Then she applies the flat metal electrodes to the scalp with a metal electrodes to the scalp with a paste. Wires from the electrodes are connected to the EEG machine to collect brain waves. Set up time takes 20-30 minutes. The EEG collection time is about 20-30 minutes. Post-EEG cleanup takes 5-10 minutes for a total EEG duration of approximately 60 minutes. During the EEG, depending on your child's age, she may be asked to hyperventilate. Flashing lights also may be presented. We hope that children fall asleep during the test obtain brain waves during awake and sleep states. We request that child will be sleep deprived prior to the test. Your child will be resting on a padded “bed”. Clean your child's hair the night before so that he/she arrives for the test with clean dry hair. DO NOT USE CONDITIONERS, HAIR SPRAY, OILS or other hair products as these interfere with the EEG. Your child may take all prescribed medications in the morning unless instructed otherwise. Sleep Deprivation: for children 3 years of age or older, the night before the EEG please have him/her go to sleep 1-2 hours later than normal and the morning of the test wake him/her up 1-2 hours earlier than normal. Your child may eat normally before the test but AVOID CAFFEINE (coffee, tea, some soft drinks, chocolate). Due to limited space in the EEG lab, one adult is allowed with your child during the EEG. If you will have other children present, please bring another adult who may attend to your other children in the waiting room.